Very few of us are going to be a part of the team that wins the Super Bowl, the Stanley Cup or the Kentucky Derby. But as a few lucky members of the Bluewater family can attest, in our world, weighing the heaviest fish at the Big Rock is pretty much the same thing. With a history that reaches back almost 60 years, the Big Rock has spawned legends, stimulated economies and supported the community in a big way. 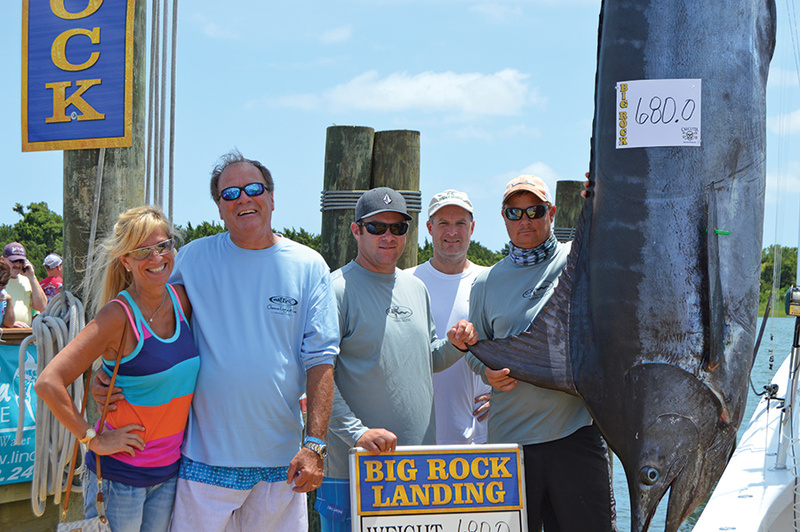 Now one of the largest marlin tournaments in the world, in addition to paying out some of the richest purses, Big Rock has donated over $3.5 million to charity thus far, funding a broad spectrum of need ranging from band uniforms to cancer centers. 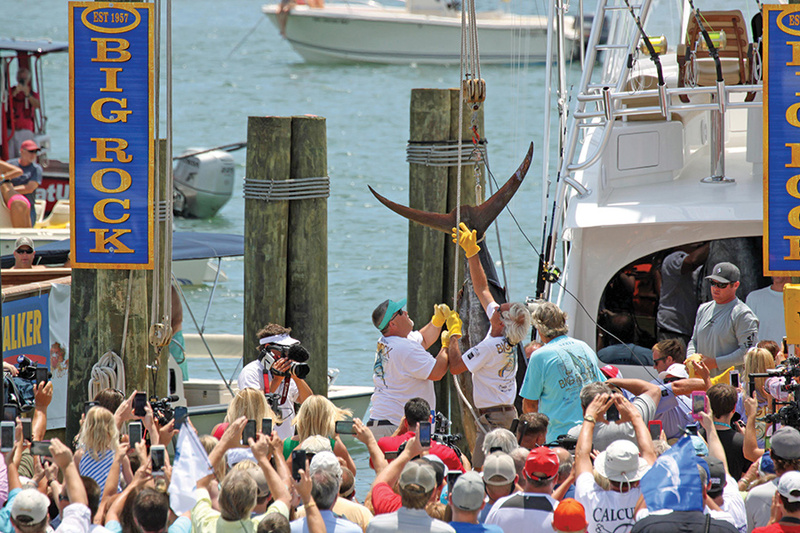 Bluewater is honored to support this world-class event which spans nine days, including the Keli Wagner Lady Angler Tournament and the pre-game Sunday Pig Pickin’—hosted by Bluewater Yacht Sales and our sportfish brands. 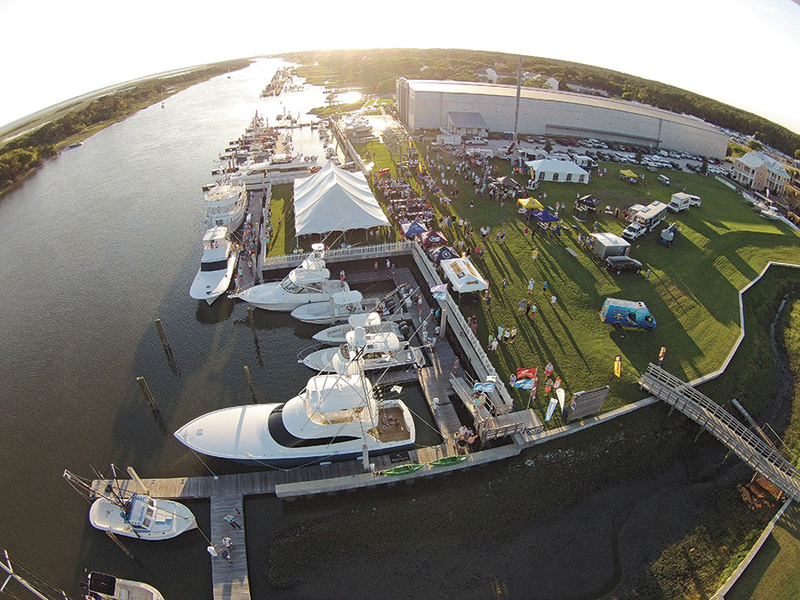 Last year Bluewater helped kick off the traditional Pig Pickin’ at Front Street Village with a dockside display featuring select Jupiter, Back Cove, Jarrett Bay and Viking models. This line up included the demo Viking 62, fresh off the production line, whose crew took a break from rigging up to join the party. Plates of barbecue piled high as people took advantage of the friendly atmosphere, beautiful weather and chilled refreshments while the anticipation continued to build. Someone was going to get lucky this week—and those heading out the next day all hoped the game would swing in their favor. One aspect of the Viking Yacht Company’s commitment to their product quality and customer experience is their dedication to their demo program. They hire only the best crews and ask them to wear many hats in proving their boats tournament worthy. The demo crews become the front-line quality control team, helm chair ambassadors and cockpit coaches— and that’s in addition to keeping skills and hooks sharp and a new boat shiny. But their number one priority is always the comfort and security of the varied guests they host day in and out from pre-dawn to well after dark. This is not a job for slackers. For them every day often is a tournament day—with a boat full of VIPs to boot. Captain Brian Komer and mate Mike Provow were the seasoned duo that pulled away from the factory docks just days before the Big Rock to meet the rest of their team in Beaufort. The day one Bluewater contingent included Bluewater partner Earle Hall, salesmen Mark Connors, Sandy Thorpe and Clark Sneed—who invited friend and new Viking 42 owner Bill Morris to experience the action. Far from Earle Hall’s first rodeo, stepping into the cockpit that morning had to be more like a homecoming—the crew, old buds and the routine, familiar with the usual tournament kick. For Bill Morris it was more like opening up a whole new frontier. The first day proved to be pretty but with a decent groundswell giving it a call of “four to six” foot—but no roll aboard the 62 thanks to the Seakeeper installation. “I was already hooked having taken delivery of my 42 Open in the Spring,” said Bill Morris, “but this was like throwing me into a whole different ocean — these guys are amazing and the boat just took everything that was thrown at it and rides like the finest piece of machinery. It was an incredible experience.” Lines went in the water at 9:00 am and there they were aboard the finest kind of rides, helmed with experience and loaded with skilled hands on the first day of the Big Rock. The level of excitement at that stage of thegame is palpable. Any of a 100 things could have gone wrong from the split second that the fish hit the line all the way to it being hoisted at the scales—and still could— they weren’t yet there. The big blue marlin lounging across the back of the monster cockpit was hooked in the first 15 minutes of the tournament, on the first day of the tournament on the boat’s first day fishing, ever. The whole set-up seemed hard to believe; just how lucky were they going to be? Back at the dock the word spread and news crews joined the steady stream of friends and fans lining the streets of the waterfront and crowding the scales. Big Rock Landing was overflowing; the docks built especially to showcase the weigh in— loaded. Thousands of listener’s tuned into the live streaming radio and video feed. The audience alone for this event is mindblowing. Pulling in the inlet and idling down the waterfront to the scales has got to be one of the most highly charged experiences in our sport. You can ride it. Every cell phone on the boat is either off or going off and bouncing off nerves. Excitement, anticipation, fear—it’s all there buzzing between bodies like an adrenaline overload. Then the boat swings around— all eyes glued to the cockpit the moment: pure rock star. The weigh-in crew swarms the boat like stage hands, Randy and George all business, consummate pros. After checking out the fish, it’s rigged up and hauled into the air. The crowd hushed and breath baited, all straining to hear Randy read the scale. When they called it “680!” the adrenaline surged and the high fives flew. By Saturday the Viking 62 was fished out, the week was up but this would be a day of nerves until the bitter end. Earle Hall confessed, “I literally carried my iPad into the grocery store with me so I could listen to Randy on the radio.” Of course 18 minutes before lines out, Suzi Q called in a blue marlin hooked up. “That was stressful,” afraid for those minutes that his luck was finally up—lost in the last minutes of fishing. But in a quiet sort of flourish, it was revealed that their luck had truly held as that last hook-up proved not to be a blue marlin. Randy Ramsey called lines out and there it was, the Viking 62, team Bluewater and Earle Hall’s lifetime fish at a whopping six hundred and eighty pounds won the Super Bowl of fishing—even did it in the first hours of the tournament, in the first hours on the boat—but they had to work hard for their luck—and they’ll never forget it.